The top big bands on both coasts can be found here at David Levin Entertainment. These include the 18-piece DLE NR Orchestra, the best Nelson Riddle-style group in the U.S. with a world-class drummer and Sinatra-style vocalist, the 14-piece Rex Allen Big Band here in Northern California and The TH Orchestra in Palm Springs. 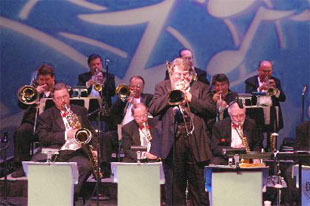 These and our other large swing groups have decades of experience performing at events and have many "A" players. They provide bandstands for their performances which is "the polished look" preferred by our clients. All of our orchestras offer male and female vocalists. Play lists for these groups are available. 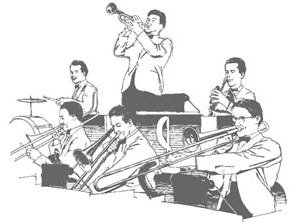 Benny Goodman, Artie Shaw, Harry James, Glenn Miller and Tommy Dorsey arrangements are the favorites of these bands. We hope you enjoy their MP3 tracks. Live video links of some of these groups are available on request. Some of these groups can be seen in person depending on their rehearsal schedules. Due to attrition and the movement towards cover groups, djs and small dance combos, the number of large dance groups has greatly diminished. In spite of this, David Levin Entertainment continues providing talented, large swing groups. Our dance orchestras have performed for society events in New York, Palm Springs and San Francisco including the Gala 2000 event at The St. Francis Hotel. Our orchestras are based in the San Francisco Bay Area, Southern California, Las Vegas and on the East Coast. They have performed at The Mark Hopkins and Fairmont Hotels in San Francisco, The Hotel Bonaventure in Los Angeles, The Rainbow Room in New York and at many other noted venues. For Washington, D.C. performances, our NR Orchestra will bus in from out of town saving our D.C. clients airfares. Our dance orchestras are available at any site across the U.S. and Canada. 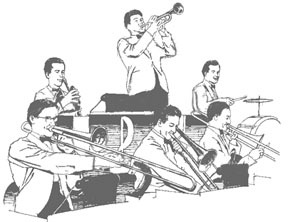 The TH Orchestra (a 14 to 16-piece with vocalists) is one of Southern California’s most talented 40s commercial Swing big bands. 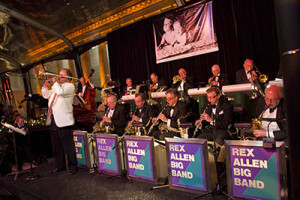 Now in its 30th year, the 14-piece (pianist-vocalist), 15-piece (female scatting jazz vocalist) to 16-piece (with stand alone male vocalist and scatting jazz female vocalist) Rex Allen Big Band is the only nationally known Swing band headquartered in the Bay Area. They have done three national tours.